This depends entirely on you. It can be anywhere on your themes template. But I would suggest putting it in the Footer. So, we have to edit only the footer.php file and the links will be shown through every page of your blog. 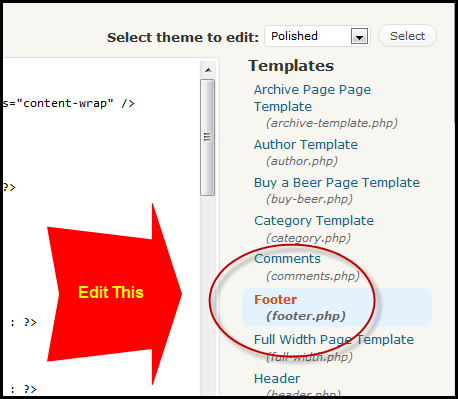 Go to your WordPress Dashboard » Appearance » Editor and this will show you the lists of files of your theme. 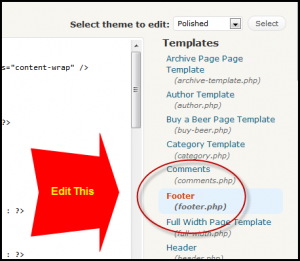 Now select the footer.php file. Now, somewhere inside your footer.php file, place this code. 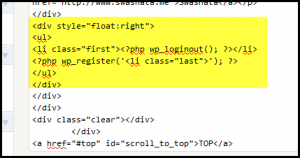 Note that the appearance of the login/logout and site admin buttons will depend on where you have put the code. I have placed it at the very end of the footer wrapper div. Save it and you are done. View your site. It should appear as a normal unordered list. You should have noted that we have put a class inside the <ul> and also the <li> Element. Now lets see how we can use the class to design it a little. Just place the following code in your style.css file. Hit Save and you are done. Now view your blog. You should be impressed by now! 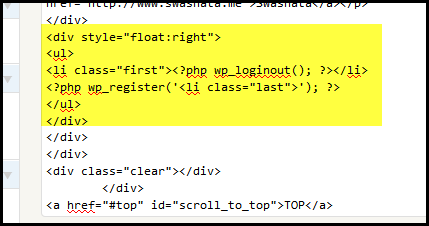 Basically here we have used two wordpress API functions. It is used to show Registration link to users not logged in and Site Admin link, to logged in users. If you dont have enabled registration for any users, then it wont show any link to general visitors of your blog. * not logged in and registration is enabled or to the dashboard if logged in. * @uses apply_filters() Calls 'register' hook on register / admin link content. * or log out depending on whether they are currently logged in. * @uses apply_filters() Calls 'loginout' hook on HTML link content. And thats it! Quite simple right? Do let us know how you have modified your theme. Also dont forget to drop in your feedback. css is not my strong suit. where exactly do i place the code in style.css? its really very helpfull, can we highlight the logout text ! when a person is logged in ! and one more q sir, how do i redirect a url when a person click on logout! I would like to know how to re-direct someone back to my site once they log in, rather than taking them to the WP dashboard. hi, my theme support inserting html block in the top right corner of page. I saw one site using the same theme and he had put login | Register links. These links exactly look as your links on the bottom. I need such html code. Can you please help me in this regard? You can put such HTML using the theme function if you like. But, adding a dynamic login and logout button is not possible. Thanks for the reply. I’m talking about cyberchimps.com They are using ifeature theme. Anyhow thanks for the reply. Can you please see there site and tell me how can I get such dynamic button and where shoud I please that could you mentioned in the tutorial as I tried to do but it was failed.